The Month of March is finally here! For us on the East Coast it means spring is around the corner. I am personally anxious for some blue skies and sunshine! Let's start the month off with a new sketch shall we? This month we have a sketch that will allow you to use some of those left overs you've been hoarding! Yes... we all have a piece or two laying around just waiting for something --- so let's create a layout with those pieces! 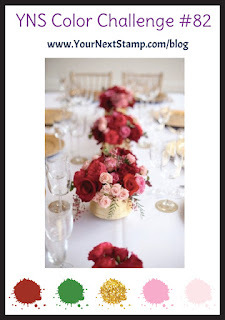 You can use 1 photo that measures 4"x4" and another smaller one 2"x2". 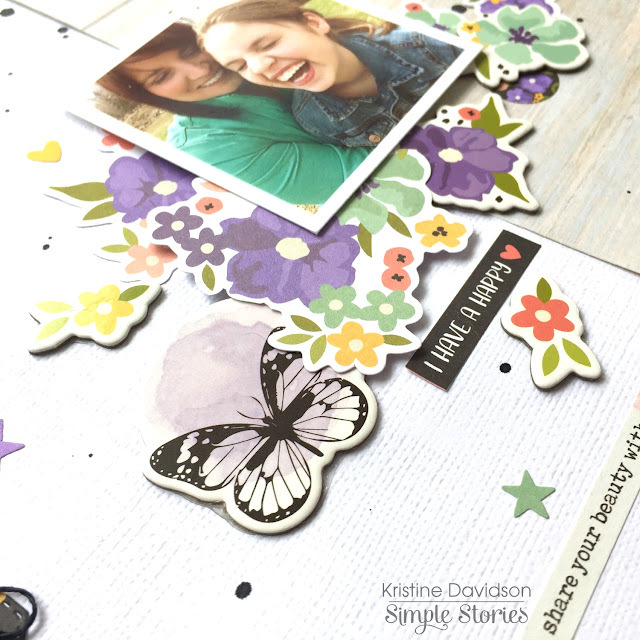 Create different sizes of circles and stars and you have one awesome layout! I would love to see how you interpret this month's sketch. Please support Creative Scrappers by visiting our affiliate link! 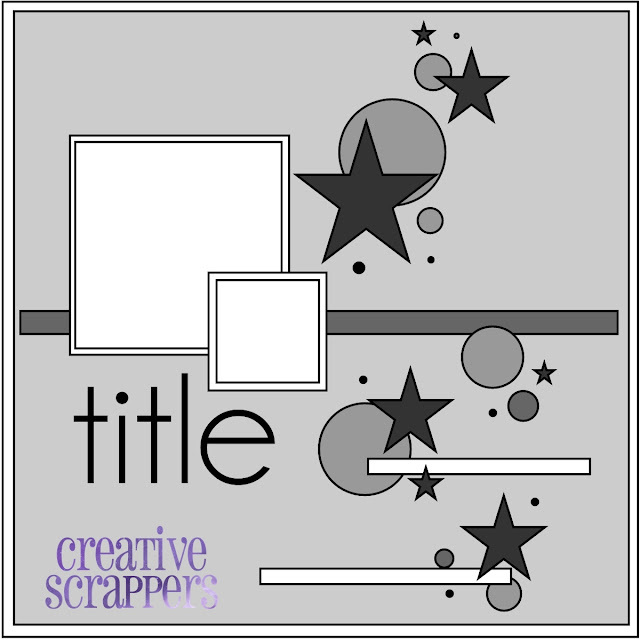 No cost to you except great prices on scrapbook products! Now is your time! Don't delay ... send in your application TODAY! 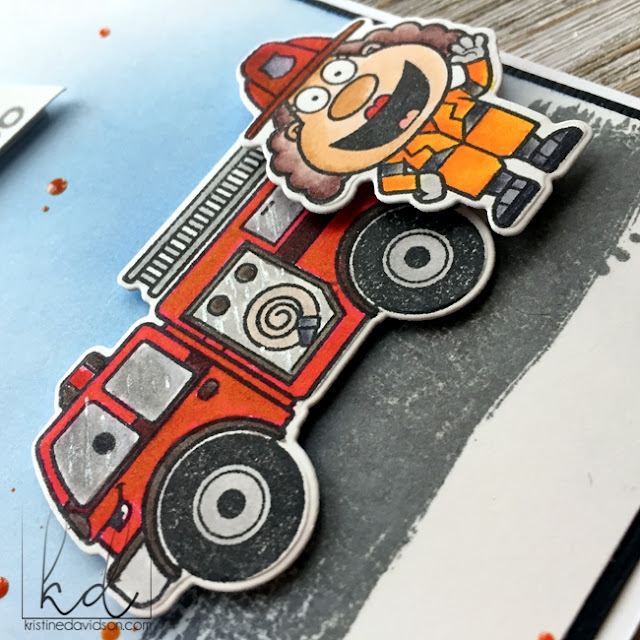 If you are looking for a crafty challenge join us at YOUR NEXT STAMP ! Challenge #83 runs through March 15th. There is a sketch and also a color combo to choose from. If you feel like it you can use one or both ;) Play along for the change to win a YNS Store gift certificate. One random participant will win a $15.00 gift certificate to the YNS Store, plus if the winner uses YNS products on their creation they will receive an additional $5.00 on their gift certificate. 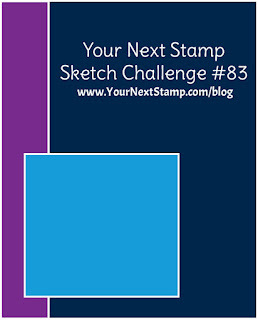 I have a card I created for the Your Next Stamp Challenge #83 this month! I completed both challenges on 1 card - the color challenge and the sketch. 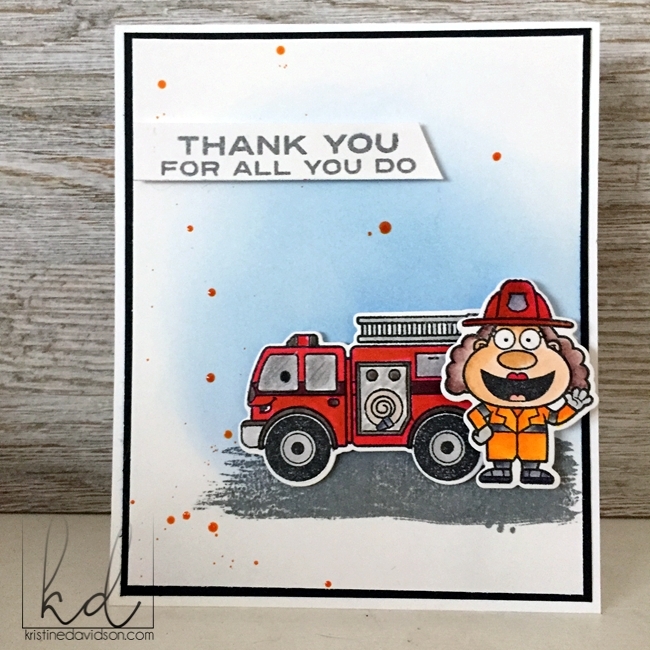 I used the stamp set Fur-ever Friends. I used distress ink for my background and also the Paint Swooches & Splatters for my carpet in the living room! I did some embossing on the chair and I colored the images using my Zig Clean Color Markers. I used some pop dots for the chair, the girl and also the dog on the chair. It has a 3 dimension look to it. 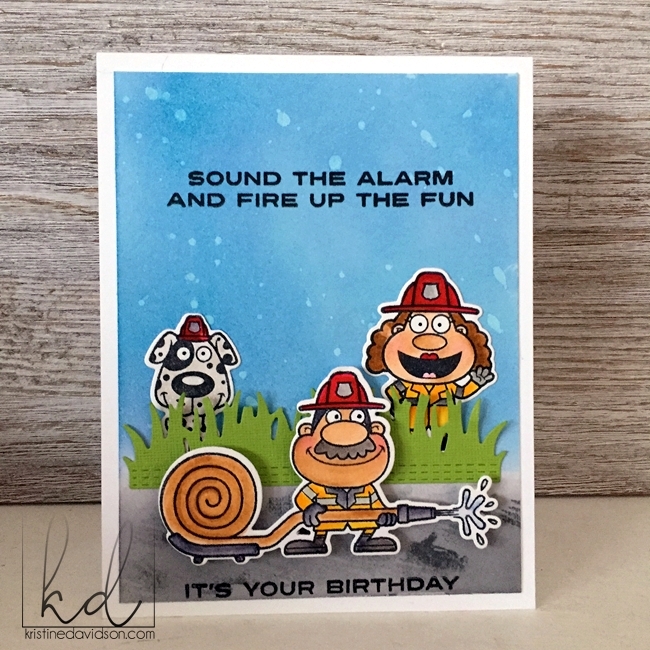 I really enjoyed created this card and it's one of my favs. Those little kitties right ?! Sooo cute. The one on the left under the chair is Archie and Willie is just watching from afar! There are more projects on the Your Next Stamp blog and you can play along with us! Thanks for stopping by today, and I’ll see you again soon with another card! I am back joining the Your Next Stamp Design Team for another challenge! It is called a Winter Warm UP. I created a card that was about having FUN in the SNOW! I have great memories about fun winter activities and how much fun we had skating in the homemade ice rink or spending hours at " Death Valley" sliding in our Tire Tubes.. great times! 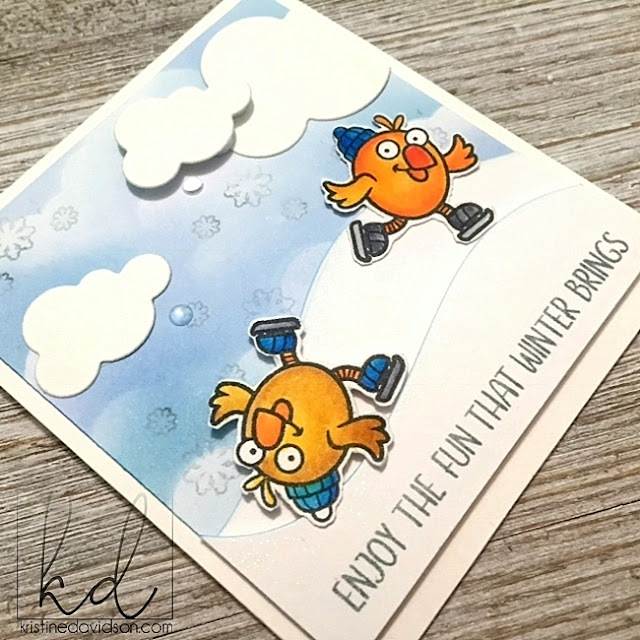 Now, head on over to the YNS blog for all the Design Team projects and leave a comment on the Winter Warm UP post on the YNS blog for a chance to win a stamp set of your choice. A comment must be left by February 24th at midnight EST. The lucky winner will be announced February 26th. I am back joining the Your Next Stamp Design Team for another challenge this week. 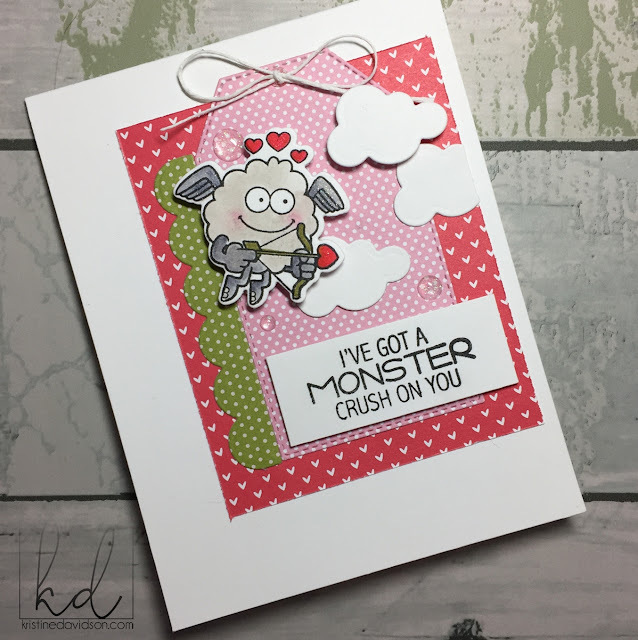 It is called a DT Dare which means we are sharing more projects made with the stamps from the February release. What is our DT Dare this month ... Layer It Up! This was a fun challenge for me since I use popdots on pretty much everything I create and adding layers is what I do. I used the cutest Fire It Up Stamp set to create my card. Come Join Us on the YNS blog and you could WIN a stamp set!! It's time for the new February release at YOUR NEXT STAMP! So Many super cute stamp sets are being released today. These are all great for birthdays, thank you notes, hello friend and so much more! The new sets include Fire Up the Fun, Music Chicks, Star Girls and so much more! My first card is a super cute one I must say. I have no relations with firefighters at all but these are too much fun! I colored these with my Zig Clean Color Real Brush Markers and some distress ink for my background. I added some grey and black ink to resemble pavement and I used a small stamp from the Paint Swooches and Splats for the texture in the pavement. 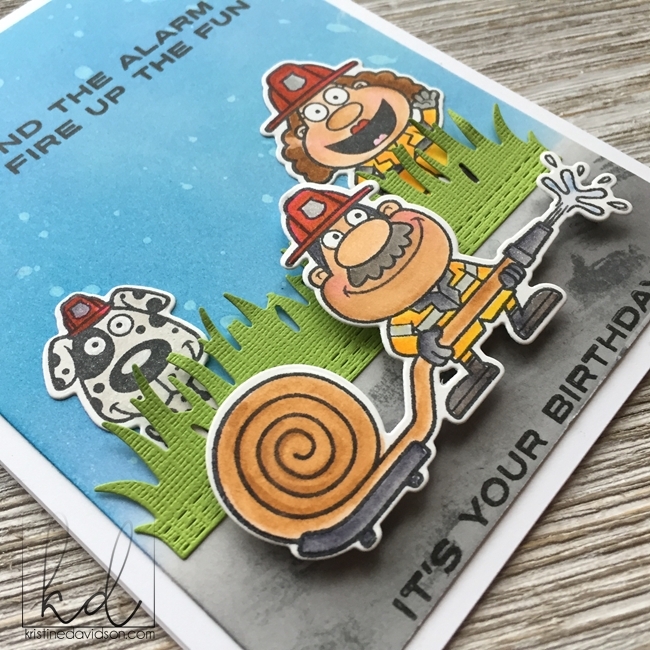 I used the Stitched Grass Die for some grass so I could add my little dog and firewoman in the background. I added the firefighter on the front with popdots for dimension and then my sentiments. Be sure to visit the YNS Store to see all of the New Products and take advantage of this fabulous sale!! Save 20% Off Your entire Purchase!!!! Hurry! There is also a chance to win an awesome PRIZE... a $25 Gift Certificate to spend at YNS! All you have to do is leave comments along the hop to be entered to WIN! 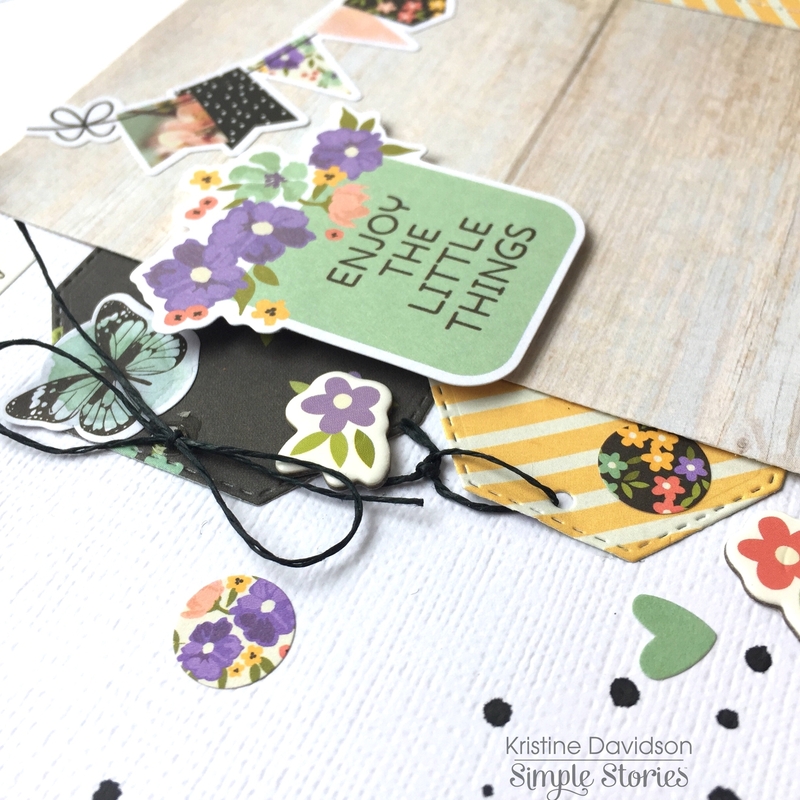 It's time for a Sneak Peek of Your Next Stamp's February Release my friends! This release is full of cuteness. If you are a stamper you will NOT be disappointed. 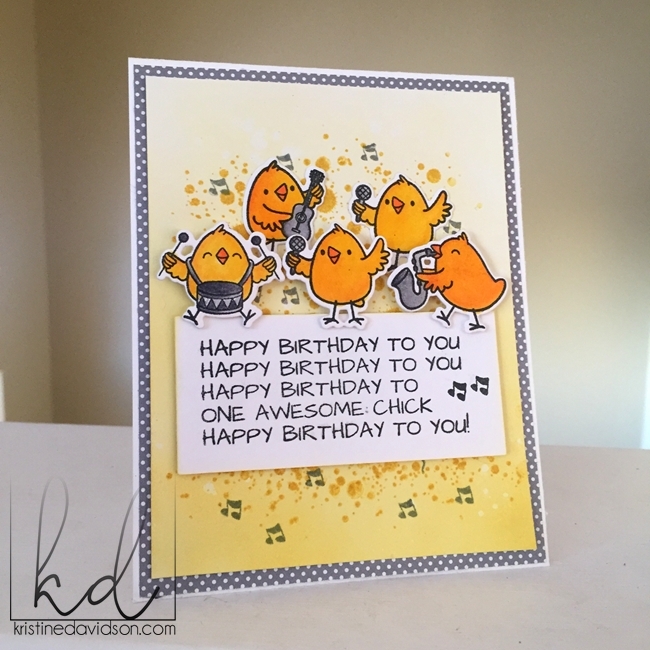 I am featuring a super cute set called Music Chicks! I love those little birdies and the fact that they play a musical instrument is even cuter! I used some distress ink for my background and added some paint splats with a stamp set called Mini Ink Splatter. I colored the chicks with my Zig Clean Color Real Brush Markers and added some popdots for a few of them to give them dimension. I will return at 10pm EST on February 10 for a full reveal! If you are looking for a crafty challenge come join us at YOUR NEXT STAMP ! Challenge #82 runs through February 15, 2018! 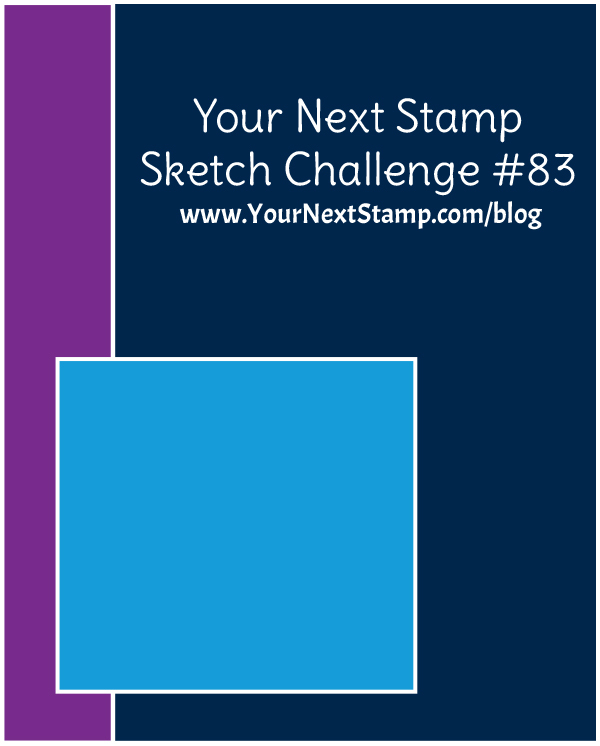 There is a sketch and color combo to choose from, unless you really want to challenge yourself and combine the two! Play along for the chance to win a YNS Store gift certificate. I have a card I created for the Your Next Stamp Challenge #82 this month! I actually completed both challenges on 1 card - the color challenge and the sketch. 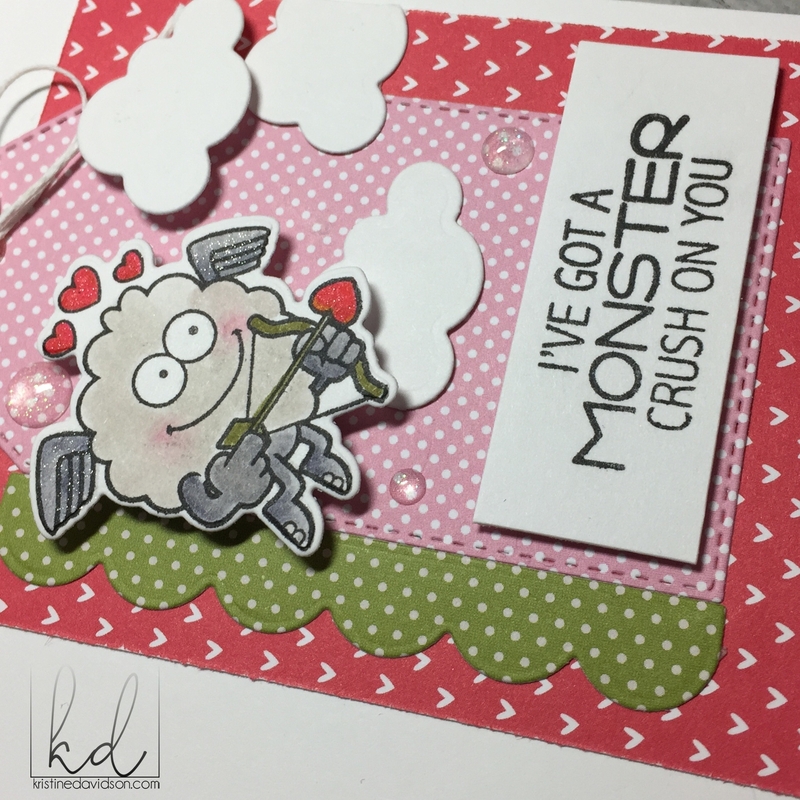 I used the stamp set Silly Love Monster, some misc patterned papers and the Puffy Cloud Die Set. I placed my red background on a card base and created a tag. I added an edge using the Little Ledges Die Set. I then used Pop dots under the cute little cupid to give it dimension. I added my clouds and 1 of them with popdots. I added my sentiment and some gumdrops for texture. That’s it for my card today! 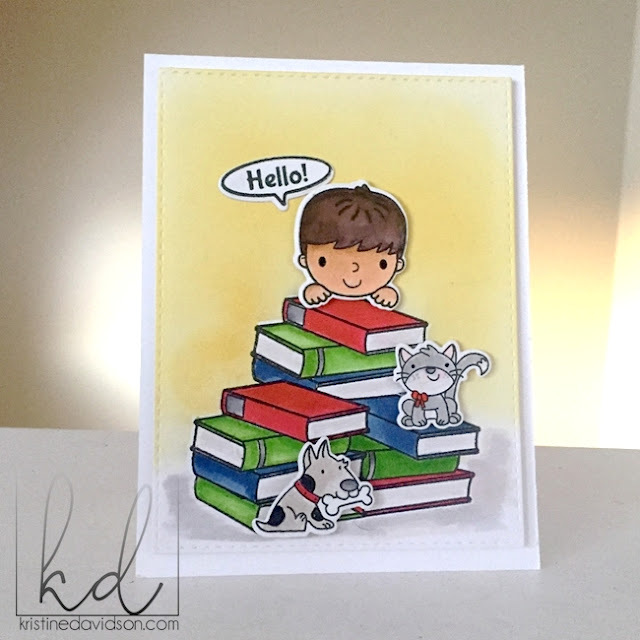 I recently created this super cute card using a stamp set from Your Next Stamp called Fur-ever Friends. I love little kitties and this little one was soooooo cute! I wasn't sure what to do with the books at first but I found that masking a few of the books and creating a larger image was perfect. The cat, the boy and the dog are all adhered with Pop Up dots. Sometimes we have to remind ourselves to take a moment and breathe. Take a few seconds and look around and enjoy those little things that surround us. When someone is laughing we might say they are annoying, or loud, or being really silly ... but in reality those are the sweetest moments aren't they? OK I Just finished watching THIS IS US and I'm an emotional mess LOL!!! On that note, This is a layout I created for Simple Stories using the gorgeous collection called BLISS. I am really enjoying this collection because 1 - the black and 2 - the purple! It just seems like a fresh collection for this time of year. This collection is shipping in stores in the next few weeks so if you see it --- GRAB IT! 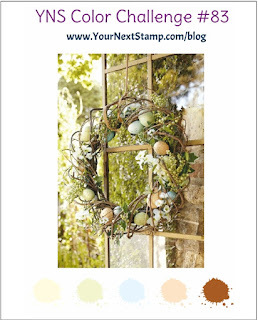 If you are looking for a crafty challenge join YOUR NEXT STAMP challenge! 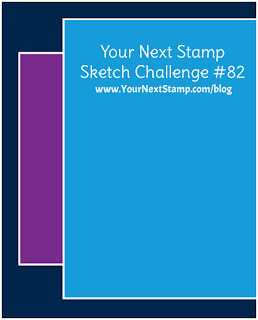 Challenge #82 starts today and runs through February 15, 2018! There is a sketch and color combo to choose from, unless you really want to challenge yourself and combine the two! Play along for the change to win a YNS Store gift certificate. Did you know that YNS Challenges come with 2 chances to win? Link up your creation for the main challenge and then be sure to share it on Instagram. WANT MORE INFO? 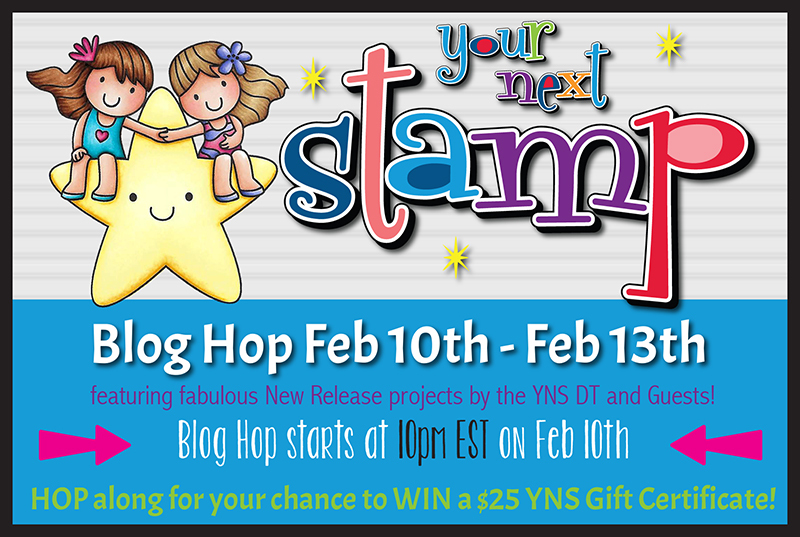 Visit the YNS blog to play and for your chance to WIN! Okay! I am a little bit excited to share some fun news with you! I have been asked to be one of the guest designers for Your Next Stamp for the month of February... YOUPEEE! This company is one of my favorites!!! - The kitties and monsters are WAYYYY too cute! 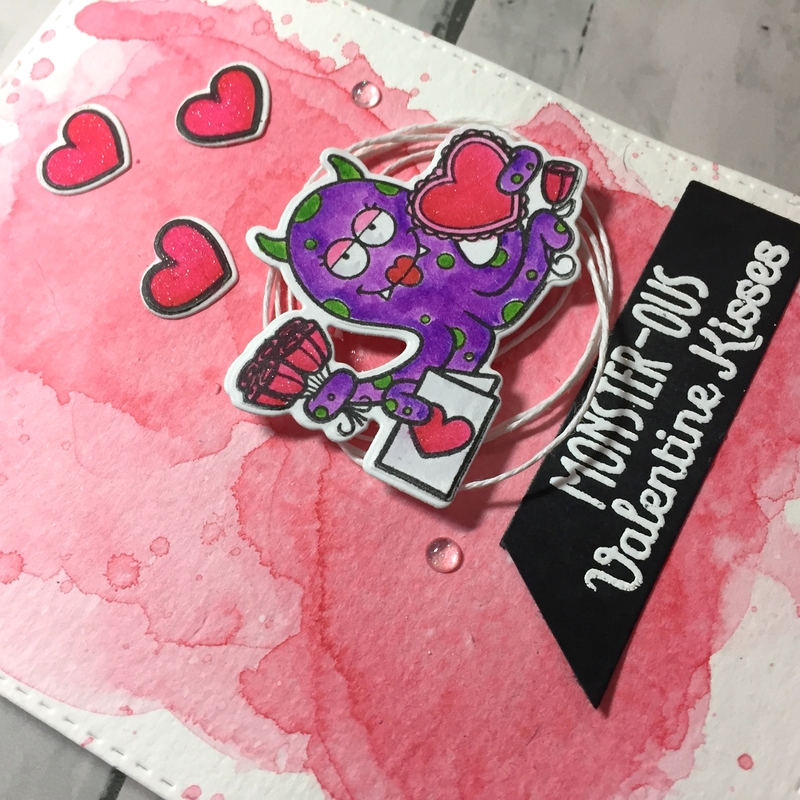 Here are a few of my favorite cards using YNS stamps and make sure you come visit my blog often this month since I will have LOTS of cards to share and well YNS has awesome monthly PRIZES! VISIT YNS BLOG for more Inspiration!